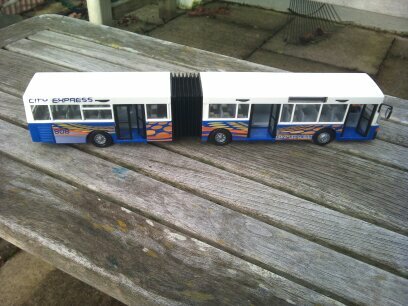 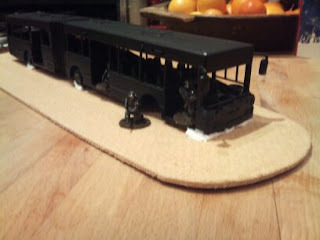 I decided my city needed more defunct transport...the bus idea came to fruition when I found this model in John Lewis at £6.99 - bargain ! 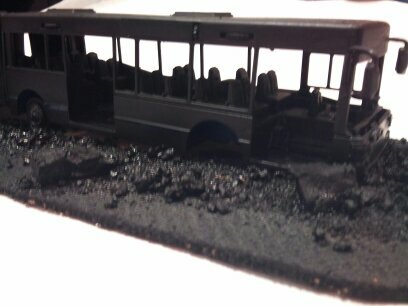 Day 1: Having pulled it apart - taken out the windows and spraying it black it went back onto a base. 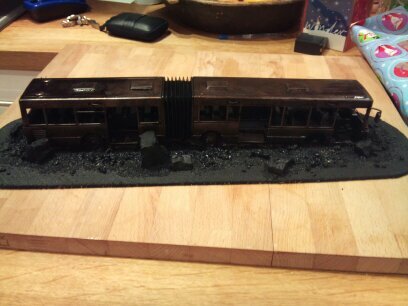 Day 2: With Stone, Sand and liberal coatings of black acylic paint we are nearly getting there. 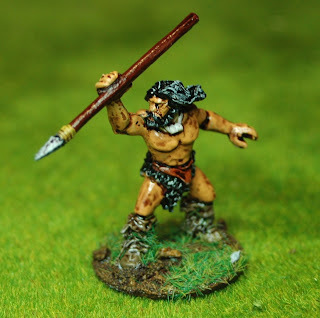 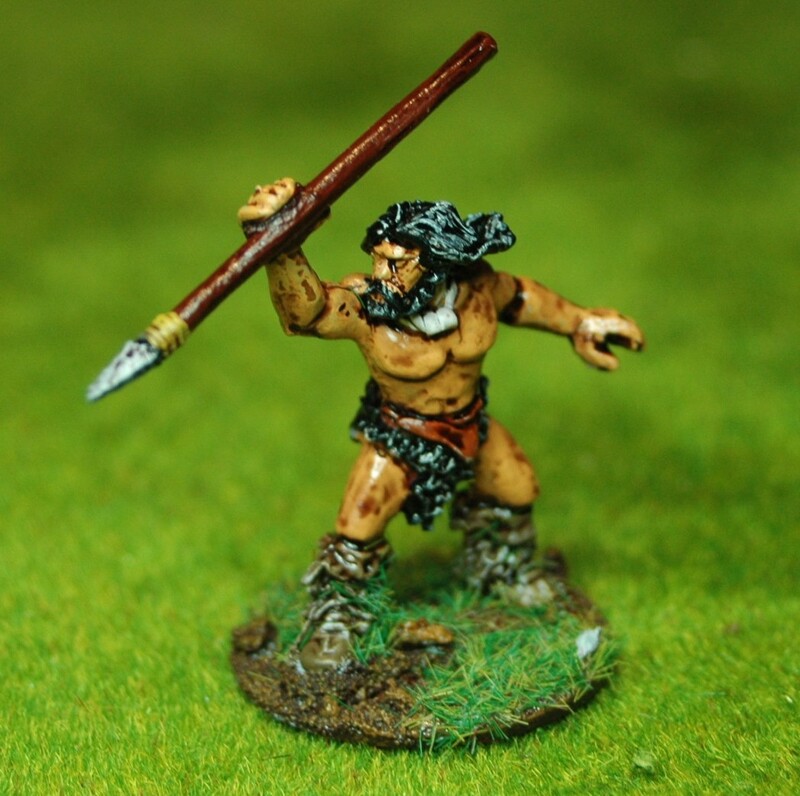 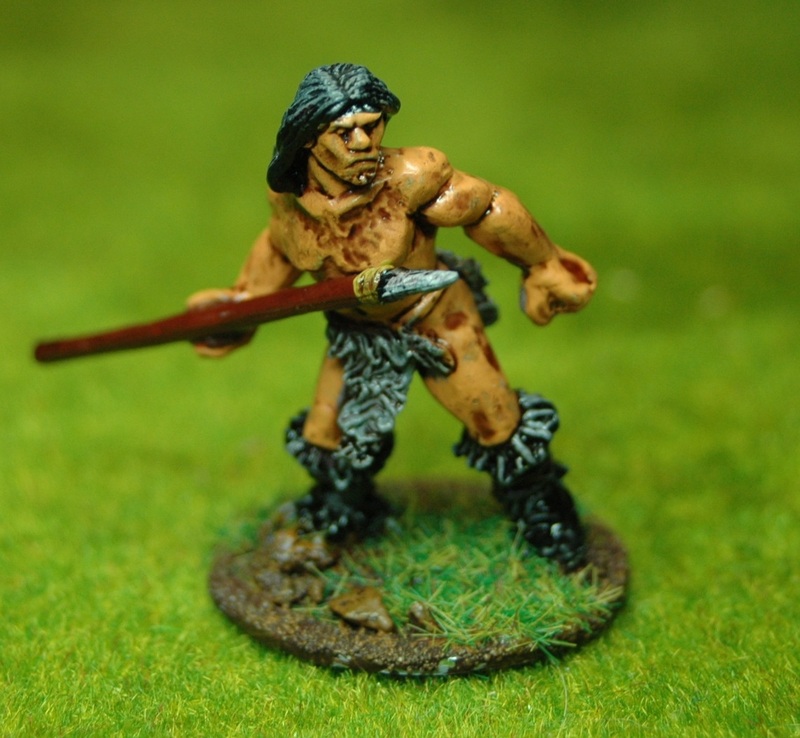 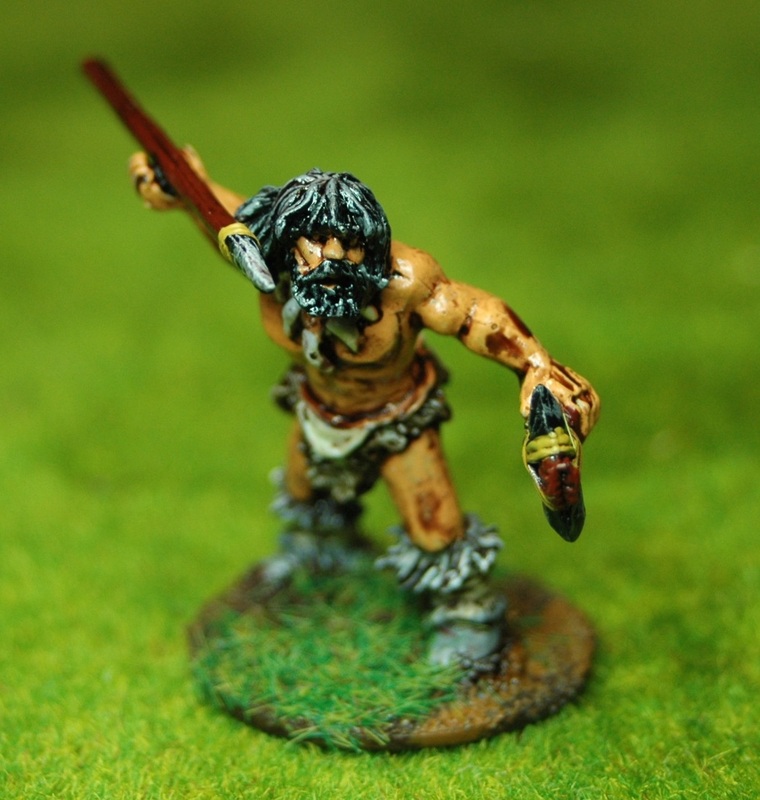 As a bit of fun and a break from painting Napoleonic figures I had a go at some Zulu figures. 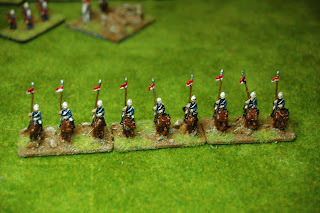 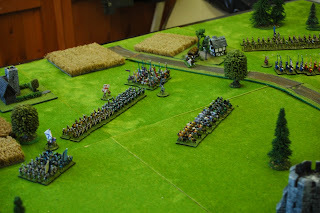 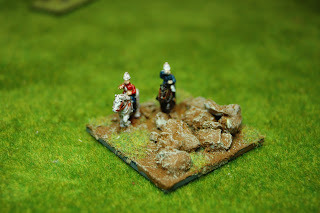 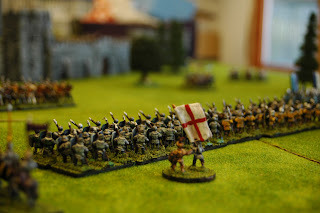 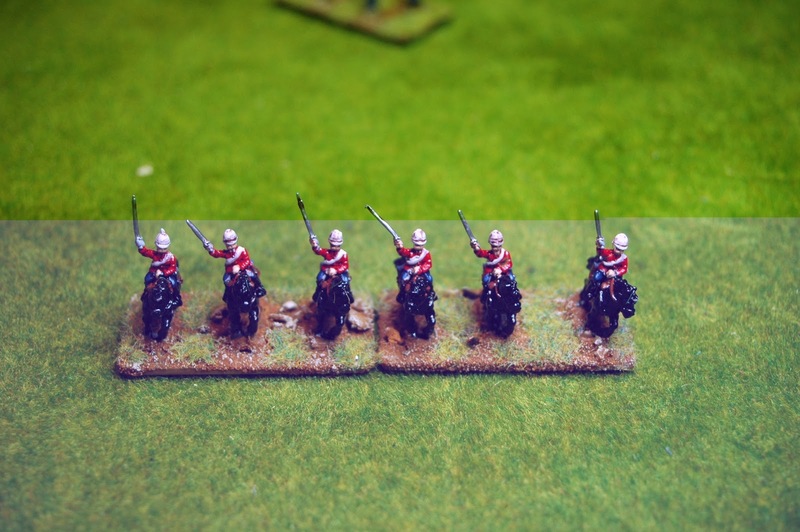 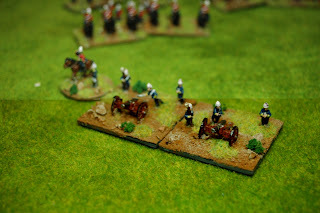 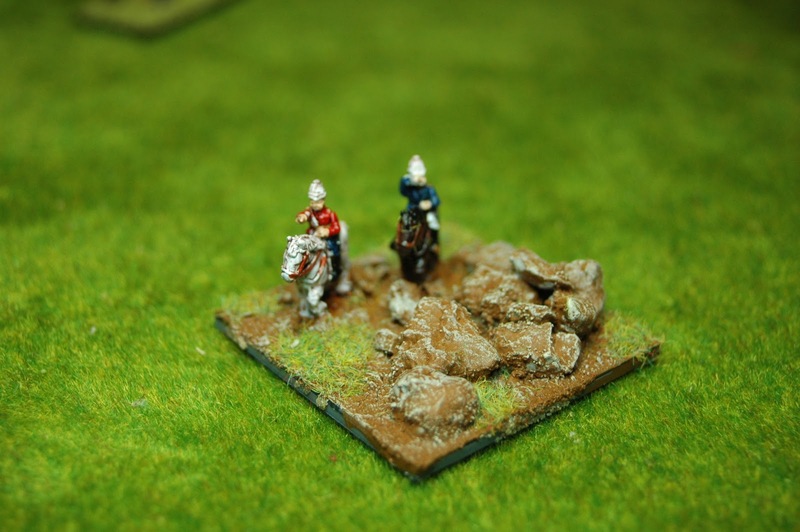 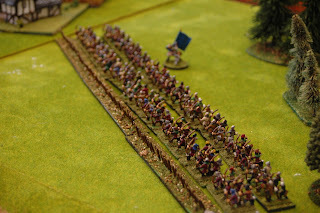 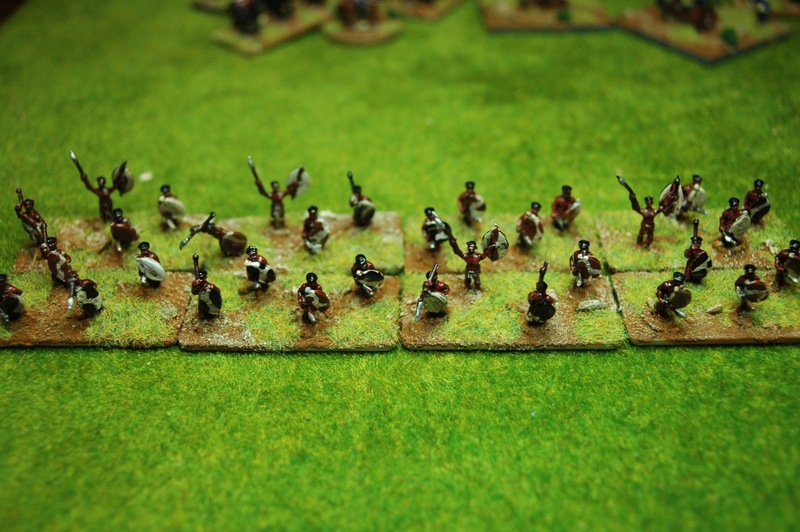 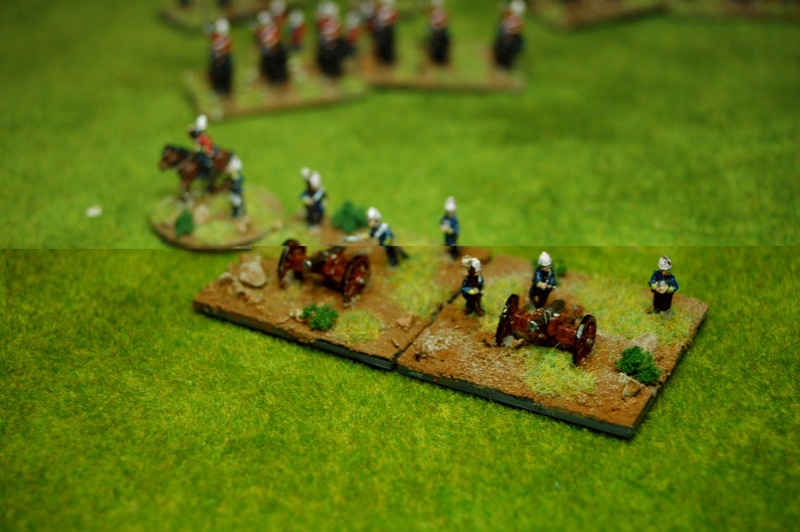 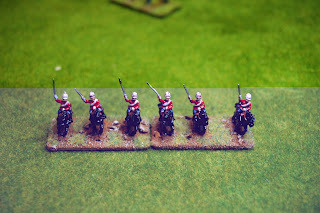 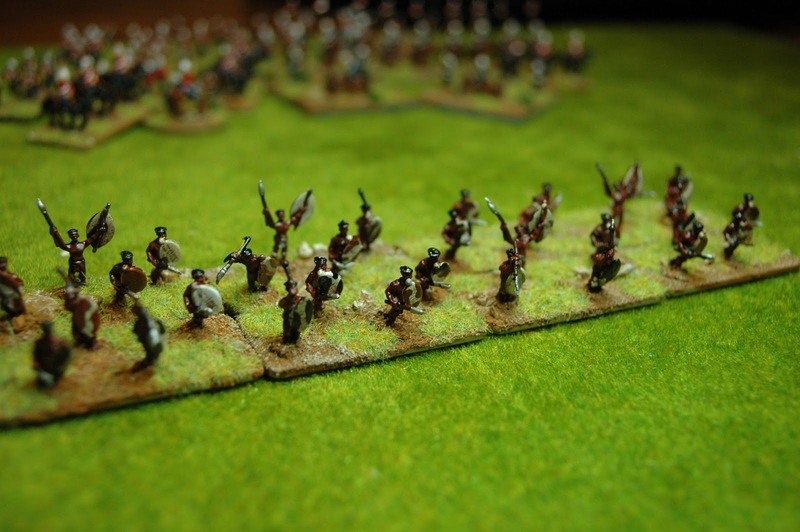 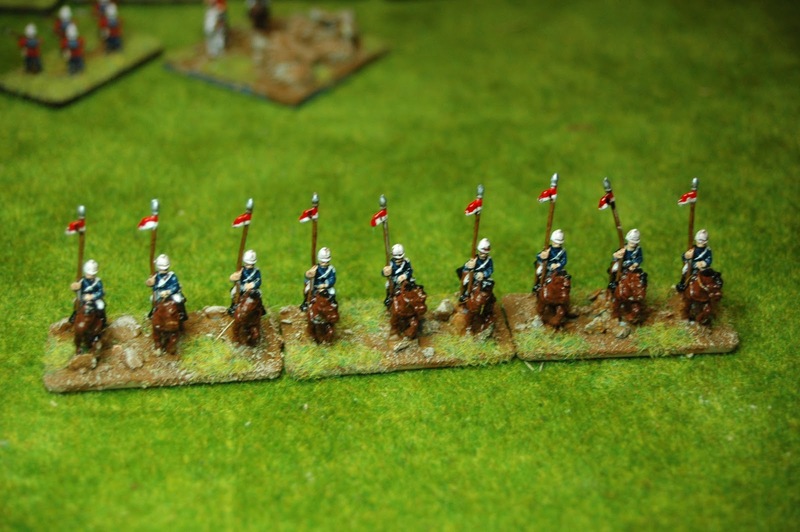 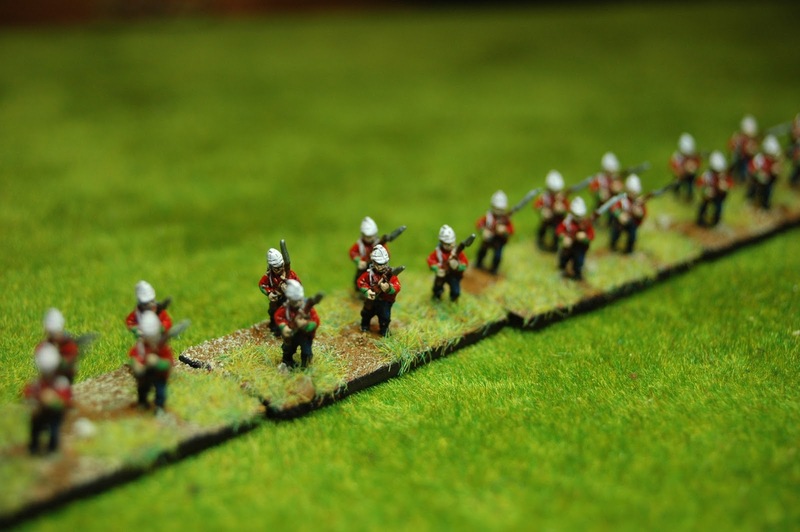 Three years ago I started out on a quest to build two Napoleonic Armies in 10mm, French and British of course. 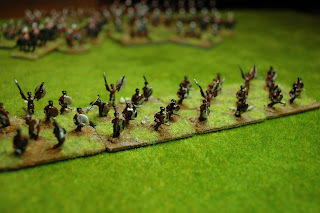 I will get round to taking pictures of all the units but in the meantime found these photos of a highland unit. 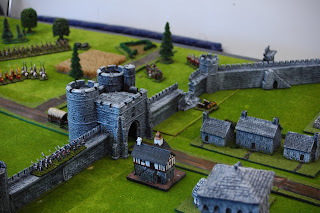 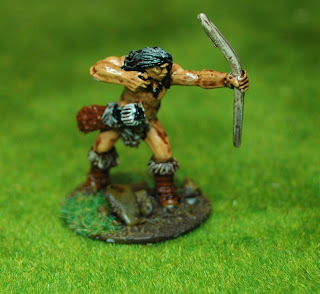 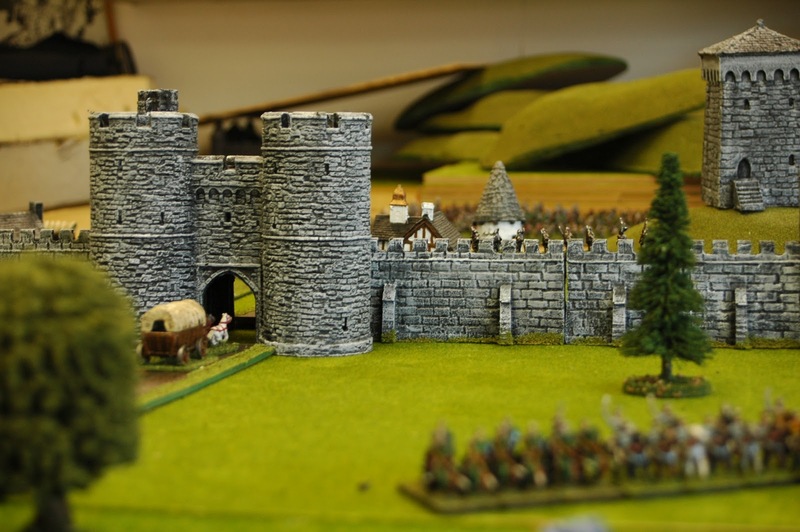 Outside of the 28mm world I have also built some fairly large 10mm collections. 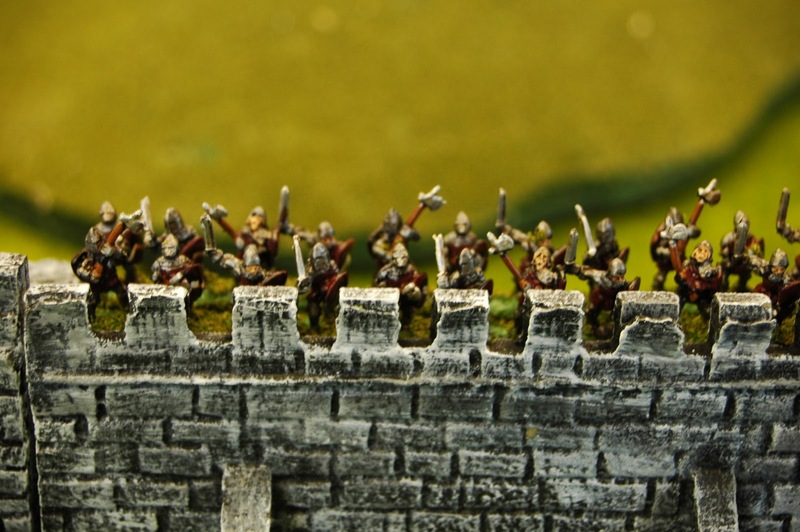 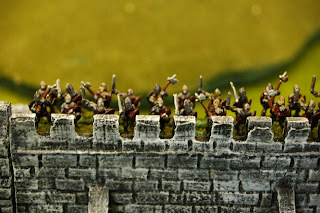 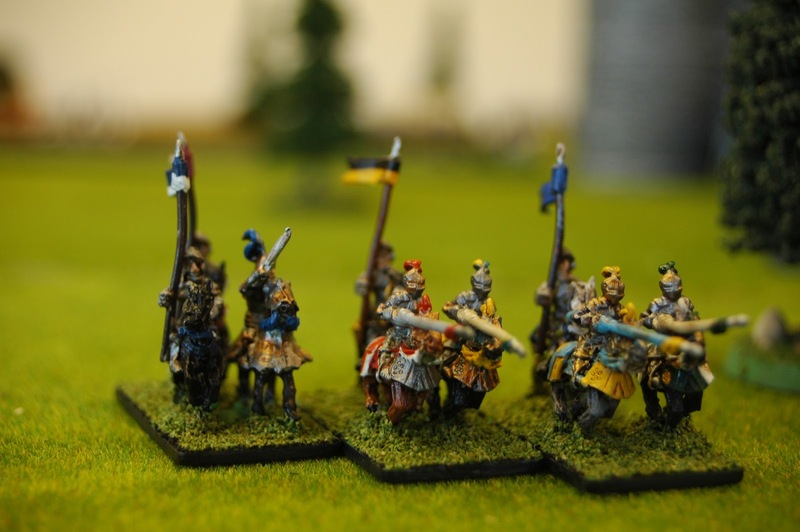 These include Warmaster Fantasy, Napoleonic and Medieval. 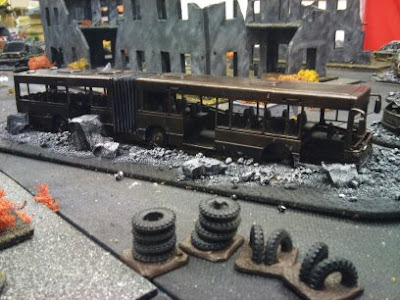 The selection of photos below were taken about five years ago. 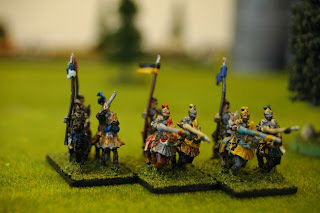 One day we'll take the knights and archers out for another spin. 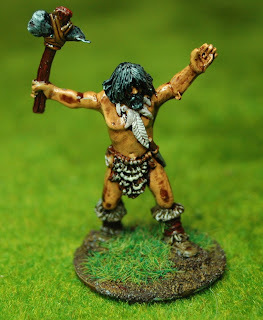 I must be mad ! 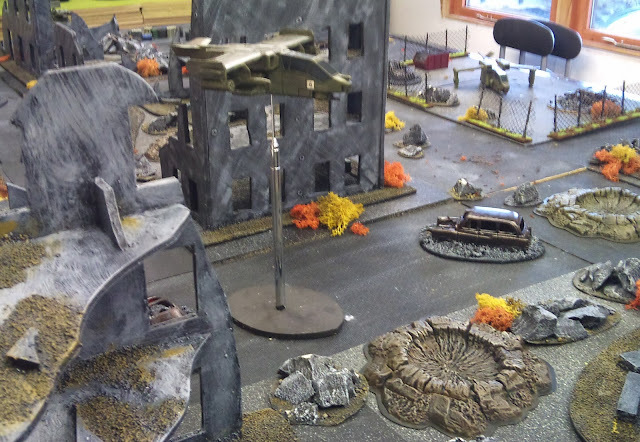 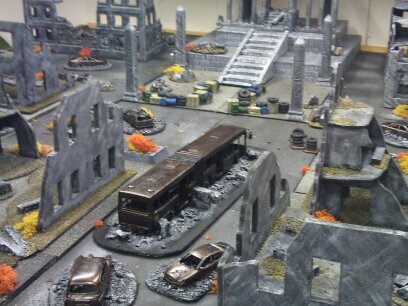 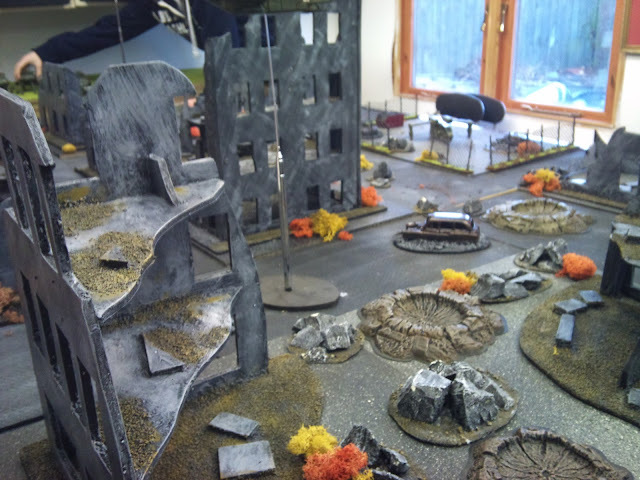 A couple of months ago I had this notion that wanted a gaming table that represented an apocalyptic warzone. 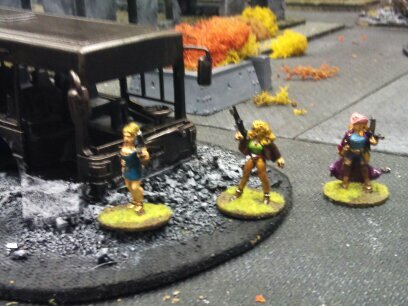 I was pushed into making this happen when I discovered the Pig Iron miniature range. 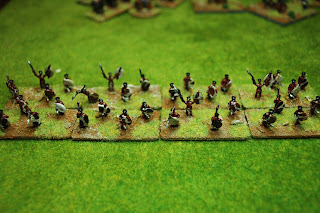 The rest as they say is history...or should I say the future ? Having given Tomorrows War a playtest last night it looks like this might be a continuing feature of the Shed. 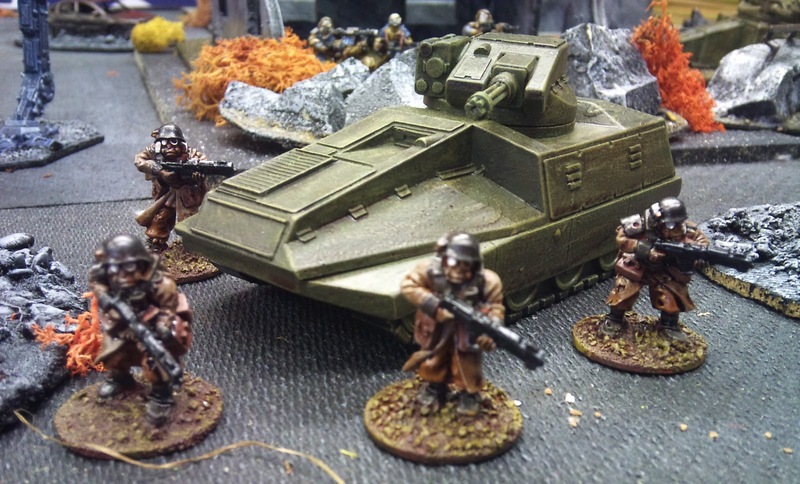 Pig Iron: Kolony troopers escorting a light tank from the Old Crow range. The Drop ship is from Old Crow, aerial stand purchased from Maplin. 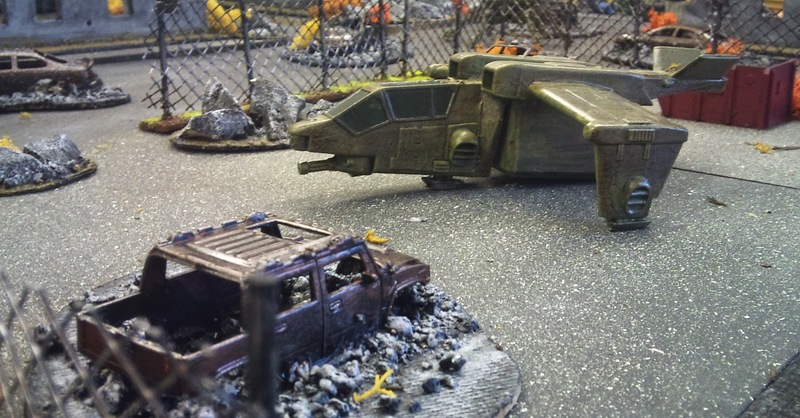 Rather proud of this dropship - bought for a fiver a Warfare's bring & buy - mind you it was in bits and needed another coat of paint. The full extent of the city - board is 3 metres by 1.5 metres- all building scratchbuilt from mdf, foamcore and hardboard. 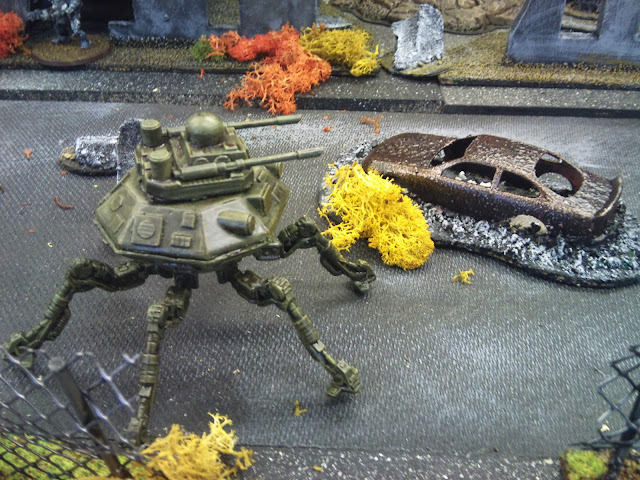 Walker ?? Sorry cannot tremember company bought a few years ago. All the ruined cars have been picked up from charity shops and 99p stores over the last six month. 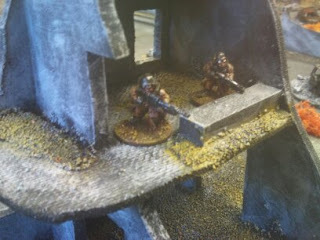 Of course I have had to rebase them, paint and rust up. Some of them were even set alight ! 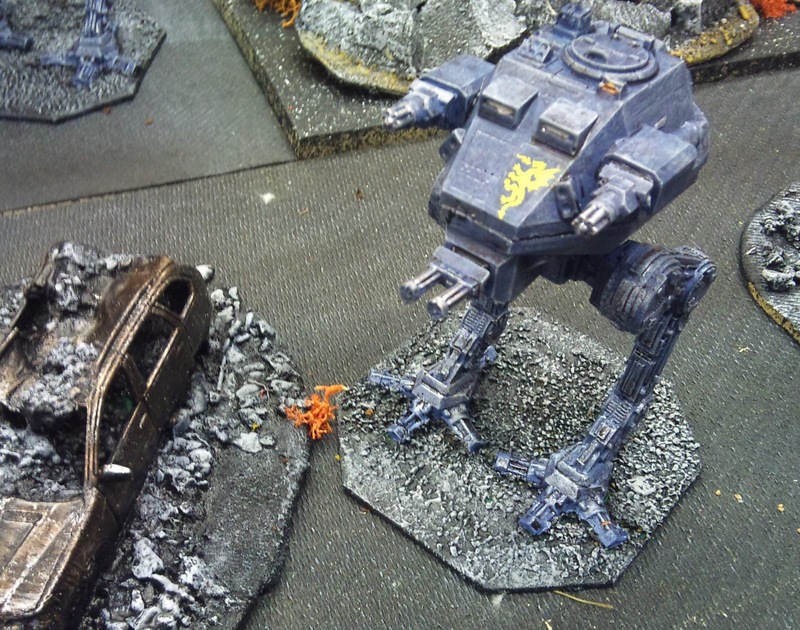 Very cool Walker - looks like the Star Wars versions - need to get some more ! 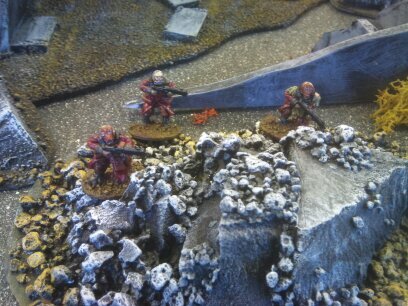 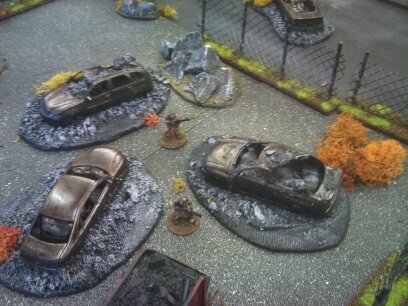 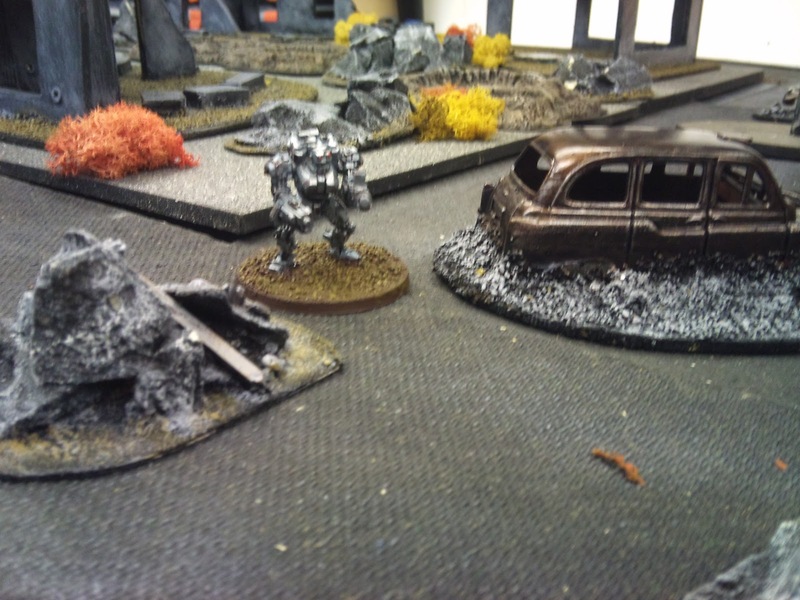 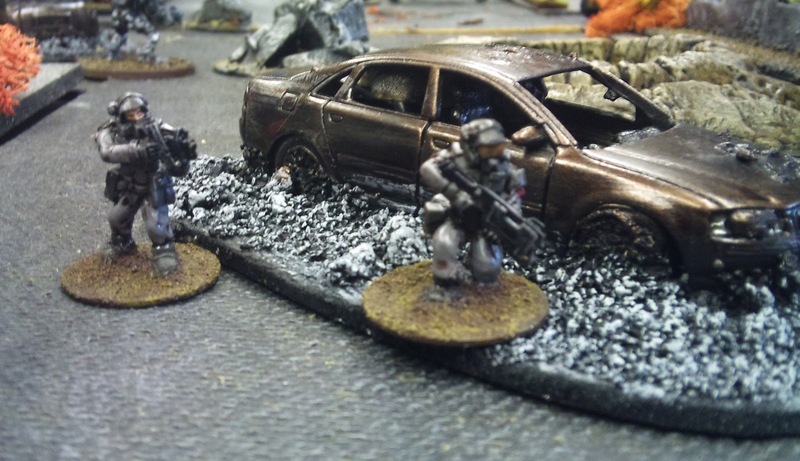 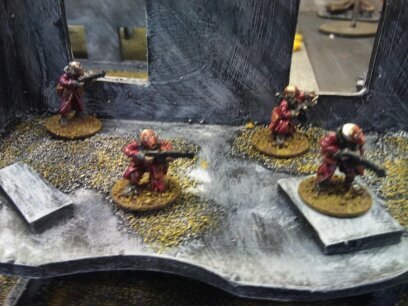 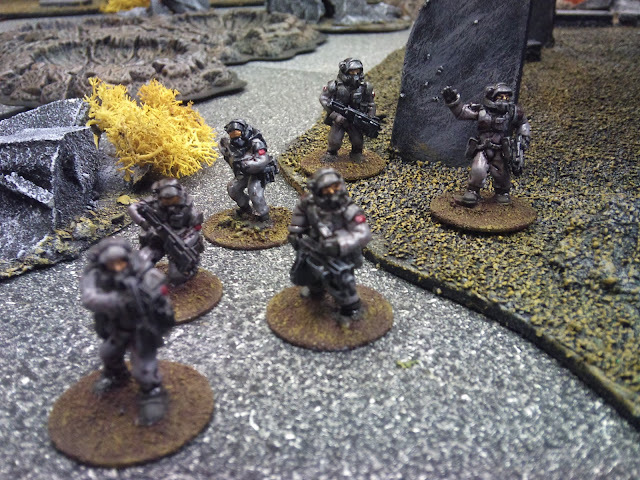 Pig Iron Troopers - note the texture of the reversed side of the hardboard roads ! 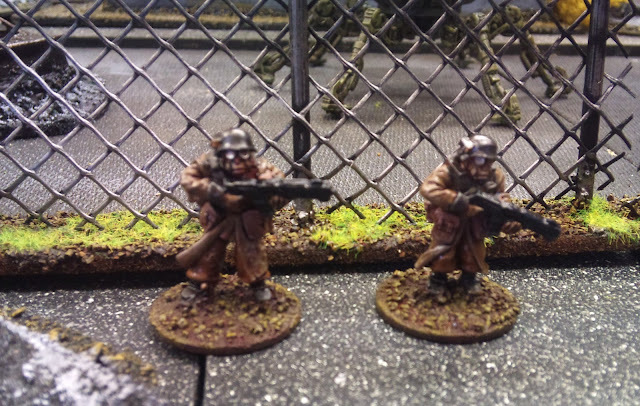 Kolony Troopers standing in front of mesh fencing made from gutter guard. 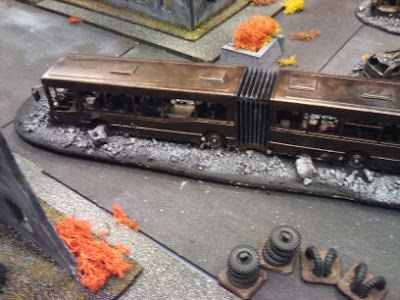 Don't ask - my eleven year old son pointed it out in the local pounstore and said dad this looks interesting...can you use it ?